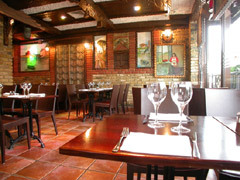 La Nonna restaurant in the heart of Wimbledon is true Italian all the way. Considering its location, excellent value and the all-round quality it offers, it’s no wonder why it's so popular with the locals. At La nonna, lunch and dinner will guarantee you delicious and genuine Italian food, excellent service, and good value for money. This true Italian restaurant instantly relaxes the senses with its rustic style, wooden seating and exposed brickwork that gives it an unbeatably warm welcome and friendly atmosphere. La Nonna’s sister restaurant, Marco Polo in Wandsworth, has successfully mirrored the same principles of all round quality to achieve similar popularity. Service is friendly and attentive. A wonderful Italian special menu can be tailored to your needs for parties of 15 people or more. The great bar list will keep the vino and smiles flowing. With its excellent cuisine, warm surroundings and friendly atmosphere, La Nonna is the perfect venue for intimate evenings out, social get-togethers or larger functions. The restaurant can accommodate up to 110 guests and features stylish and simple Italian home cooking in a modern setting and is a crowd-pleaser. The menu features slow-food care and preparation for a dynamic clientele. In addition to the normal menu of classic pasta�s pizza�s and mains there is a choice of chef's specials of the day offering regulars a new sensation. Most dishes are made with fresh ingredients. The markedly good wine list features a wide selection of wines that caters for most tastes.